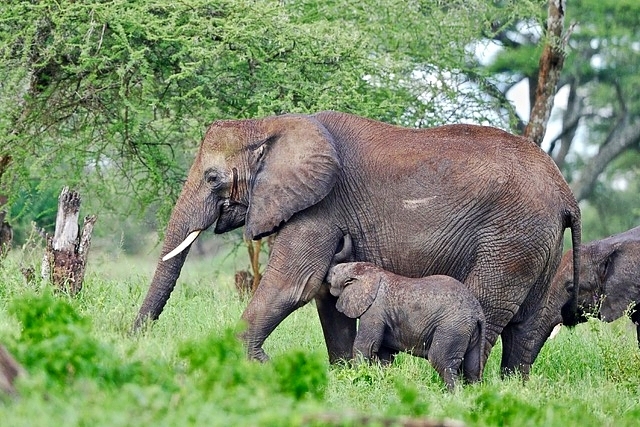 After breakfast, you will be picked up at your hotel and together with your guide you drive to Tarangire National Park. In 1970, the national park emerged from a former colonial hunting ground. He has a very diverse animal world, not least because of its size, which corresponds to approximately Luxembourg. 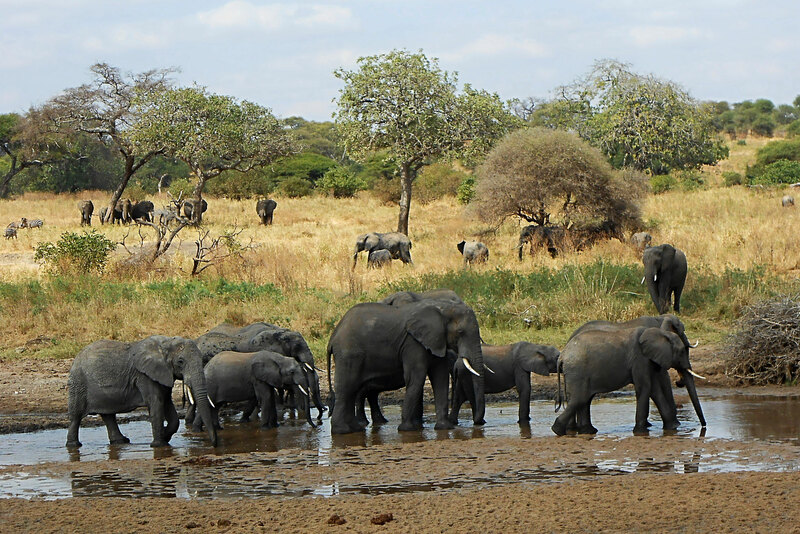 The park is home to one of the largest elephant populations in the north of Tanzania, but is also home to many other wild animals. With some luck you can spot lions, cheetahs or leopards. The landscape of the park is very diverse. Especially the huge baobab trees, which are located close together in the north-eastern sector of the park, are particularly impressive. After an extensive game drive you stay overnight at a campsite in the park. After breakfast, we head to Lake Manyara National Park. The park is dominated by the lake of the same name, which attracts large colonies of waterbirds. Particularly impressive are the pink-colored flamingos, but also many other bird species such as cormorants, pelicans or storks can be observed here. A total of about 400 different bird species live in the park. The park is also famous for its tree climbing lions, which are usually found in the central and open part of the park. During the safari you will also see elephants, zebras, giraffes, buffaloes, hippos and many other animal species. In the late afternoon you leave the national park, you will spend the night at a campsite near the small village Mto wa Mbu. After breakfast you are heading to Lake Natron. Just past Mto wa Mbu you leave the asphalted road, along the East African Rift Valley the drive continues on adventurous slopes. The drive leads past Maasai villages and the holy mountain of the Maasai, the Ol Doinyo Lengai. As soon as the Maasai village Ngare Sero comes into sight, it is not far to the lake. The outlet Lake Natron is the home of a remarkable variety of birds, in particular about 2.5 million dwarf flamingos, the lake serves them as a regular breeding ground. The water is strongly saline and the basis of life for unicellular algae and bacteria, which are responsible for the planar red-brown to purple-violet coloring of the lake. 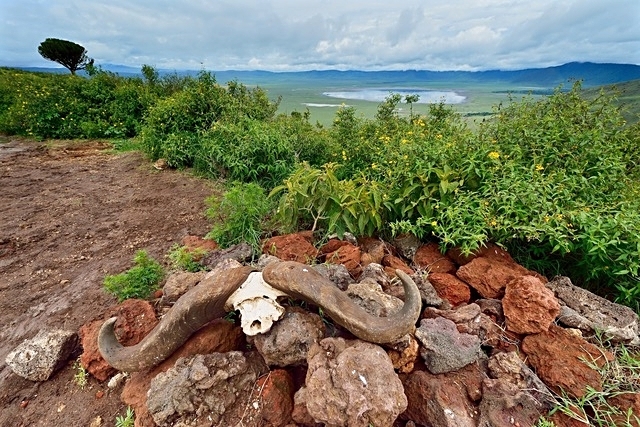 The area around Lake Natron is one of the most beautiful and unspoilt regions in Africa. You will make a hike to the lake and then you will visit the nearby waterfalls, a true oasis with awesome waters to swim. You'll stay overnight at a campsite at Lake Natron. 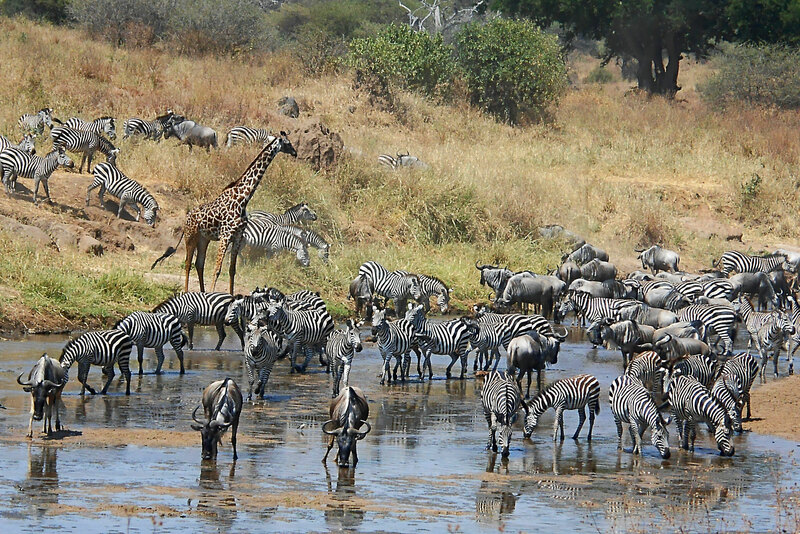 about 3 million larger mammals, the Serengeti is the national park with the richest wildlife worldwide. Around two-thirds make up the above-mentioned animal species, furthermore the park is the home to many other animal species, such as giraffe, buffalo, hyena, elephant or crocodile. 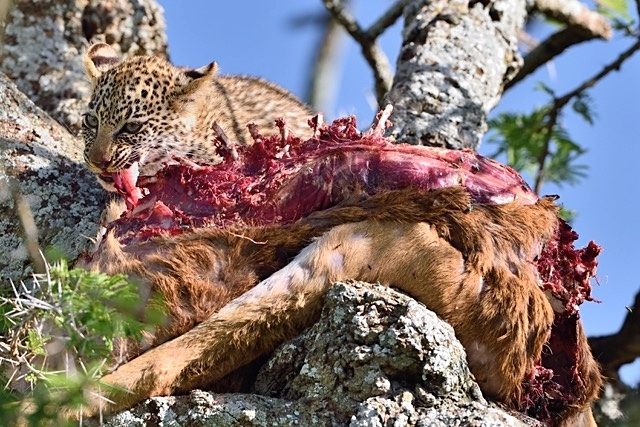 Particularly large is the population of feline predators, about 3000 lions, a good 300 cheetahs and an estimated 400-700 leopards have their hunting ground here. After the game drive, you will stay at the Lobo Campsite, which is located in the northern part of the park. Early in the morning you start to a first game drive in the park. Afterwards it goes back to the camp, where you already awaits a strengthening breakfast. Thereafter you continue with a further game drive into the central Serengeti. After an exciting day, you will reach your campsite in the heart of the Serengeti, the Seronera area. This day is completely peppered with further game drives in the Serengeti. In the evening you will return with many impressions of this long day back to your camp in the Seronera area. This morning you will continue with further game drives in the Serengeti, at noon you will leave to the Ngorongoro Crater. Both conservation areas are not separated by fences, on the way you can observe with some luck some more wildlife. You will spend the night in the Simba Camp on the upper crater rim, where you can enjoy a spectacular view and a great sunset. Before breakfast you can enjoy the fantastic view over the Ngorongoro crater in good weather. After breakfast it goes on partly adventurous roads about 600 meters downward into the crater. The crater has a diameter of 17-21 kilometers and is the home of a great animal world. Nearly all the biodiversity of the East African savannah has gathered here, only giraffes and a few other animal species for which the rock faces are too steep do not live in the crater. 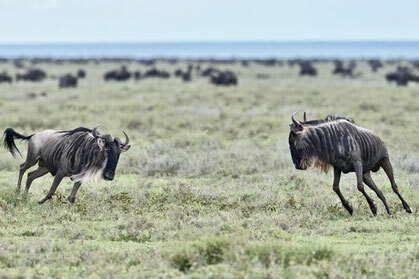 Depending on the season, 15,000 to 25,000 animals are gathering here, thereof more than two thirds buffaloes, gnus, zebras and gazelles. 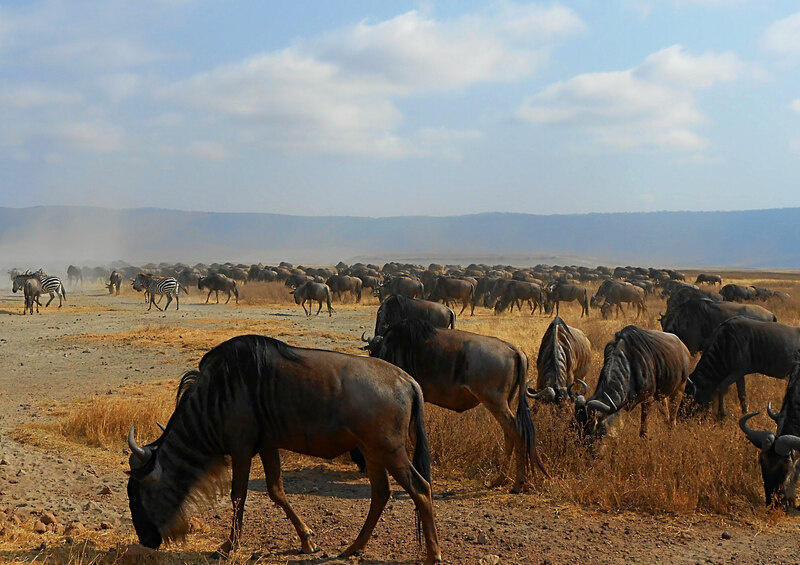 This large number of grazers also explains why in the crater the largest density of predators in Africa can be found. Beside other predators more than 100 lions live here in several prides. The chances of watching the "Big Five" lion, elephant, buffalo, rhino and leopard within just a few hours are here particularly good. In the afternoon it goes up again the steep crater walls and then back to Moshi.